Adopted on July 1, 1975. 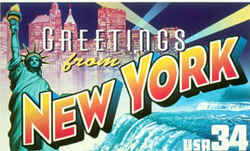 In 2006, bills were introduced in the New York State Assembly and the State Senate proposing that the striped bass be designated the official state "marine or salt water" fish. The approved bill, Sentate Bill No. 8153, also amended current law to make room for the new "marine or salt water fish" by renaming the brook trout the state "fresh-water" fish. Found in hundreds of lakes and ponds in the Adirondack Mountains and scattered in cool, clear streams throughout the State wherever cool (below 72 degrees Fahrenheit) water is available. They tend to prefer colder water than rainbow and brown trout, and they are often found in the headwaters of streams. 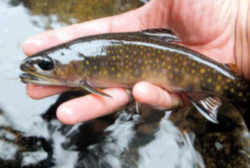 The native brook trout, called brookies or speckles, provide fine angling and the best of eating. The Brook Trout takes first place for the most popular state fish with these states claiming it for their Official State Fish; Maine, Michigan, New Hampshire, New Jersey, New York, Pennsylvania, Vermont, Virginia, and West Virginia. Taken as a whole, trout dominate the Official State Fish category with 18 states calling some type of trout their Official State Fish. The Brook Trout, (a.k.a. 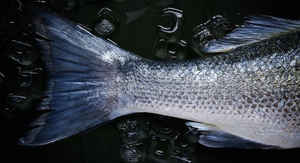 - Speckled Trout) are also called brook char and belong to the char group. They have been termed the white rat of aquatic science because more experimental work has been done on this species than any other. Since they live naturally under cool water conditions that are clean, pure, and aesthetically appealing, much of the knowledge gained from these studies help form a basis for understanding the requirements of all salmonids. Considered an Ice Age relict, this member of the char family is found only in cold water streams of the mountains. Often a brilliantly colored fish, it is readily identifiable by the white leading edge, backed by black, on its lower fins. 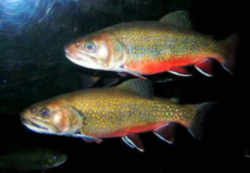 The brook trout is olive with lighter sides and a reddish belly (in males) and is easily identified by the light-colored edges of the lower fins. Its hatchery growth averages six to eight inches in length soon after birth. The brook trout is easy to catch and when a stream is made easily accessible by new roads, or other development, their numbers can be reduced by fishing, or eliminated by accompanying habitat changes. Because of their small size and tendency to be found in small, overgrown streams, brook trout seldom get to put up much of a fight when hooked. The average length is 10-12 inches but Brook Trout can be caught measuring up to 21 inches and weighing 4-6 pounds. The largest Brook trout on record was 14.5 pounds and caught in 1916 in the Nipigon River in Ontario. Breeding males develop a hook at the front of the lower jaw. Typical coloring is olive-green to dark brown on the back with silvery sides and pale spotting. All colors intensify at spawning time. The brook trout is native to northern North America and is widely distributed throughout the maritime provinces. It occurs in clear, cool, well-oxygenated streams and lakes. Brook trout are opportunistic feeders and will eat whatever they can find. In small streams they prefer aquatic insects (nymphs) that live under the rocks and along the stream bottom. They are also known to feed heavily on the adult stage of aquatic insects as they hatch and take flight during their brief courtship and egg laying cycle. Land insects, like ants and beetles, that fall into the water are readily eaten as are small crayfish. They will eat other small fish and minnows but only when they are easy to catch. This species spawns in late summer or autumn in gravel beds in the shallows of headwaters of streams. The female digs the redd where she lays 100-5000 eggs depending on her size. They hatch 50-100 days later. The life expectancy is an average of five years. The brook trout is carnivorous and feed upon a wide range of organisms. They have been known to eat their own eggs at spawning time and even their own young. 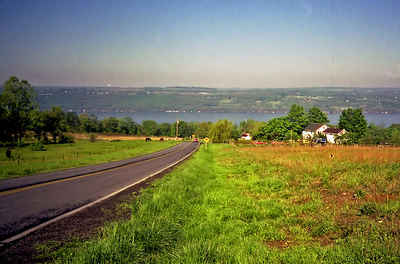 The law designating the brook or speckled trout as the official New York state fresh-water fish is Section 80 of the New York State Consolidated Laws, STL - State, Article 6 (ARMS AND GREAT SEAL OF STATE) Section 80. SECTION 80 - State fresh-water fish.